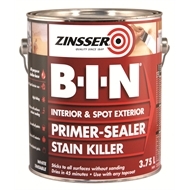 Zinsser B-I-N® is the original shellac-based primer and sealer stain blocker. It is formulated to seal, prime and block out tough stains on previously painted or new work from water, smoke and fire damage. Any oil or latex paint can be applied over it.